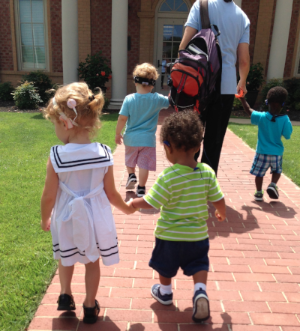 Deaf and Hard of Hearing Preschool in Memphis! The MOSD Preschool is a program for children ages 2 through 6 years. Our year-round school provides ongoing classes and therapies to help the children maintain the skills which have been developed. Preschool classes are offered on a full-time basis five days per week from 8:30 am to 3:00 pm. The children in these classes participate in a conventional preschool curriculum, with "hands-on" experiences designed to promote the development of social, cognitive, perceptual, motor, and language skills. As is the case with all MOSD classes, particular attention is paid to the development of speech and auditory (listening) skills. Preschool children attend full day sessions, learning age-appropriate academic readiness skills. All children at MOSD receive the added benefit of individual and group therapy sessions for speech and aural habilitation (listening), to further enhance their development of SPEECH, LANGUAGE, AND LISTENING skills.